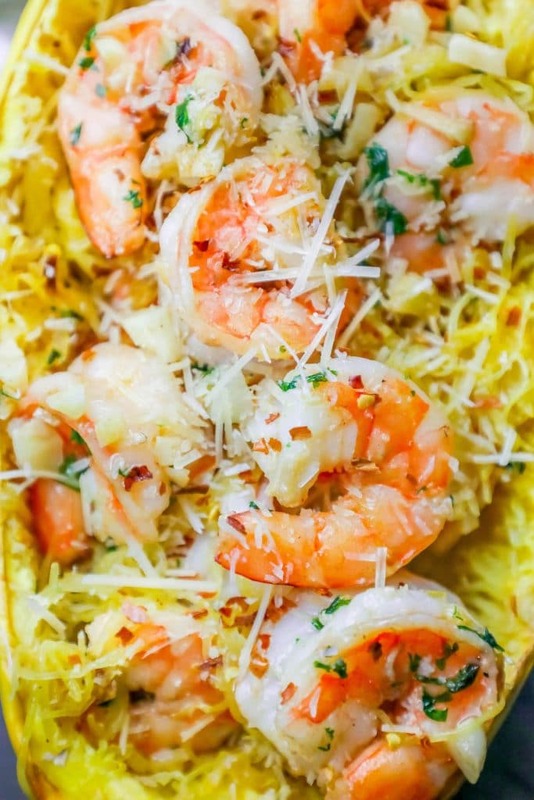 Easy delicious Low Carb Spaghetti Squash Shrimp Scampi is a keto diet and paleo diet compatible one pot shrimp scampi in a spaghetti squash boat that the whole family loves! 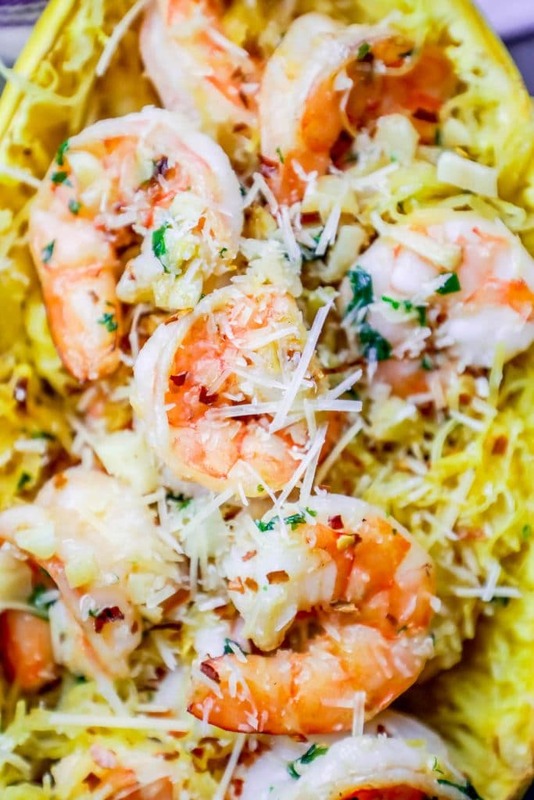 Indulgent rich flavor in an easy one pot low carb shrimp scampi recipe that is perfect for dinner parties or weeknight dinner. 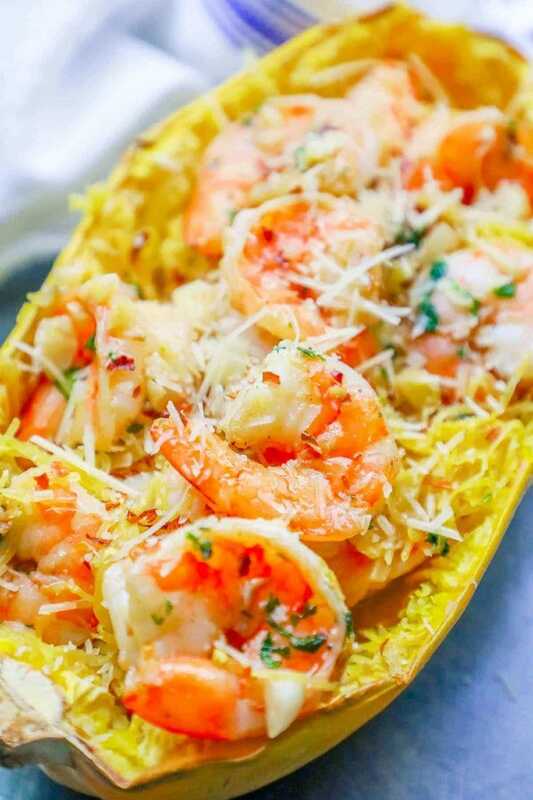 If your low carb diet has you craving delicious, easy, and comforting classics like rich and garlicky pasta, this low carb spaghetti squash shrimp scampi boats recipe is a game changer – it is rich, delicious, bursting with flavor, easy to make, and really fun to serve in the spaghetti squash “boat”! 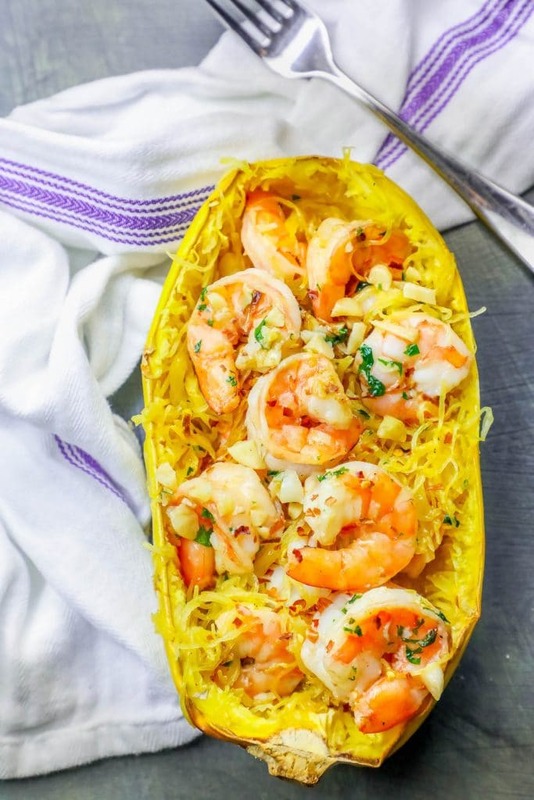 Spaghetti squash is an excellent pasta replacement – and goes beautifully with shrimp for a slightly sweet, slightly nutty low carb pasta replacement that only tastes like you’re breaking your low carb diet. I personally love serving spaghetti squash in it’s rind for the fun, interesting look – but that is totally optional. This dish is delicious in the rind, in a bowl, on a plate – or right out of the pan! 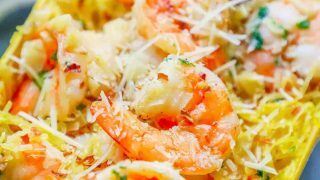 And it’s so simple, you can even make the spaghetti squash ahead of time and then just sautee it all together with the shrimp if you’re making a big batch for a party. Indulgent low carb keto shirmp and garlic pasta has never been easier! 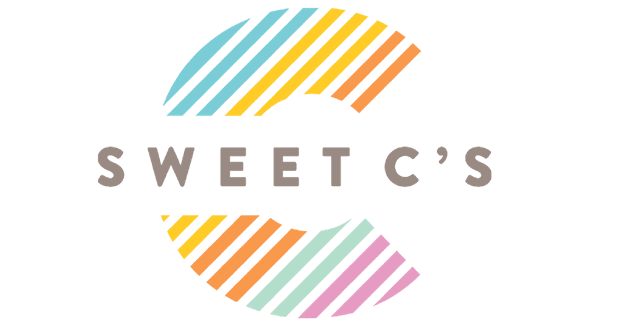 -Sharp knifes – one large chef’s knife to slice the spaghetti squash, and one small knife to peel and de-vein the shrimp if you buy shrimp that hasn’t been pre-cleaned. -To make the best spaghetti squash, I always add a little water to my baking sheet, to create a bit of steam in the oven and help get the squash cooking faster. -I like to add pats of butter in the middle of my squash while it cooks to infuse a rich, buttery flavor! You can also add in a little garlic powder to really give your squash a kick! -Let your squash cool before shredding with a fork – squash gets VERY hot in the oven and I’ve burned myself numerous times making “spaghetti” from spaghetti squash. -Use even, steady pressure to create “spaghetti” strands from the cooked squash. I press firmly, but not too rough, on a fork, and just run it back and forth over the cooked squash flesh to shred it to strings. If your squash doesn’t come up and form a string with medium, steady pressure with a fork, it is not quite cooked enough- pop it back in the oven for 20-30 minutes and try again. -Don’t overcook shrimp. Your shrimp is done and fully cooked when it turns pink and white and is totally opaque. Cooking longer will create a gummy texture and make the shrimp taste fishy – overcooked shrimp is never delicious! Perfectly cooked shrimp should be buttery, a little sweet, and not fishy at all. -Let the garlic roast. We’re adding a lot of garlic to this recipe (I actually often double the garlic in this recipe because to me there is NEVER enough garlic), but you need to cook it in the butter before adding the shrimp. Don’t let it overcook or burn – you want it to get soft, fragrant and very lightly browned but not dark brown, and it should smell rich, NOT bitter. -Toss spaghetti squash in sauce and shrimp with heat still on. This helps the flavor really sink in to the squash and come together, and gives the squash a couple minutes to crisp in the butter and wine sauce. You don’t want to cook the squash again, but rather let the recipe cook together for a minute or two at the end, just before serving. If you love this spinach parmesan garlic butter shrimp spaghetti squash scampi recipe as much as I do, please write a five star review, and be sure to help me share on facebook and pinterest! Slice spaghetti squash in half, scoop out stringy pulp and seeds, discard. Place halves, face up, on baking sheet. Pour water on bottom of baking sheet. Place pats of butter in squash halves. Bake 40 minutes to an hour, until squash is tender to the touch. If squash is not yet tender, continue to cook. When squash is soft, remove from oven and let cool until it is comfortable to handle, about 20 minutes. While squash is cooling, start cooking shrimp scampi. In a large pan, melt butter and add garlic on medium heat. Cook until garlic is fragrant and soft, about 3 minutes. When butter is melted, add shrimp, spices, and wine, and cook until shrimp is pink and opaque, about 8 minutes, stirring often. While shrimp is cooking, run a fork through squash to form spaghetti-like strings. Shred squash all the way to bottom of squash rind - but do not pierce rind (if serving in the rind as a "boat"). When shrimp is cooked, add squash "spaghetti" strings to pan and toss over high heat until well mixed. Spoon back into squash rind "boats". Top with parsley and parmesan cheese. This is SOOOOOOOOOOOO good!!! I made it tonight and I am in food heaven. I used fresh thyme because I happened to have it and it really made a huge difference I think. I worried the Chardonnay I used would be too sweet but it absolutely wasn’t. Will probably make this recipe again and again. What if you don’t have white wine? You can also use stock!